"A great book! Simply written, motivational with unique content that leads any trader, novice or experienced, along the path of self-coaching. This is by far Dr. Steenbarger's best book and a must-have addition to any trader's bookshelf. I'll certainly be recommending it to all my friends." "Dr. Steenbarger has been helping traders help themselves for many years. Simply put, this book is a must-read for anyone who desires to achieve great success in the market." "'Dr. Brett', as he is affectionately known by his blog readers, has assembled a practical guide to self coaching in this excellent book. The strategies he outlines are further enhanced with numerous resources and exercises for the reader to refer to and keep the principles fresh. I enthusiastically encourage anyone interested in bettering their trading and investing to read this book and keep it on their desk as a constant source of learning." 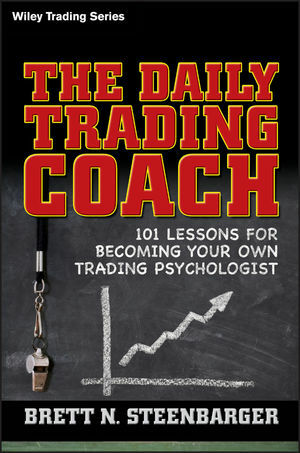 "Dr. Brett has distilled his years of experience, as both a trader and a psychologist/coach, into the 101 practical lessons found in The Daily Trading Coach. Those lessons provide effective strategies for coping with the stumbling blocks that traders often face. This book should be a cornerstone of any serious trader's library."